Steven (Chicagoland, United States) on 12 March 2015 in Plant & Nature and Portfolio. Quelle couleur et vue ces ombrelle jaune dans la serre ce vitrage et le jardin superbe. Beautiful composition with lovely colors ! What a splendour displayed under glass! Exactly what I NEEDED right now! You give me joy with the shot! Please...add some more! Une belle composition avce cette femme sous cette serre fleurie. This is a fine picture of this fabulous place. The upside down umbrellas is a nice touch. Everything is blossoming just in time ... including the woman in the foreground. What a gorgeous combination of light, colors, and detail! Ahh I miss the spring shows. Nicely captured and presented. Lots of color here to brighten anyone's day.... and of course yellow is a happy color and this gives me hope to see the coming Spring soon! We used to grow ornamental plants in our greenhouses and these are a reminder of those years! Such a beautiful composition, I love all those umbrellas!! so much colour, wonderful, new life in nature (flora) and new life with the pregnant woman in the foreground. This is just gorgeous! I love all the bright colors and the umbrellas hanging from the ceiling. Such a happy springlike feeling! This is beautiful! What an exquisite building. It almost makes me sneeze. 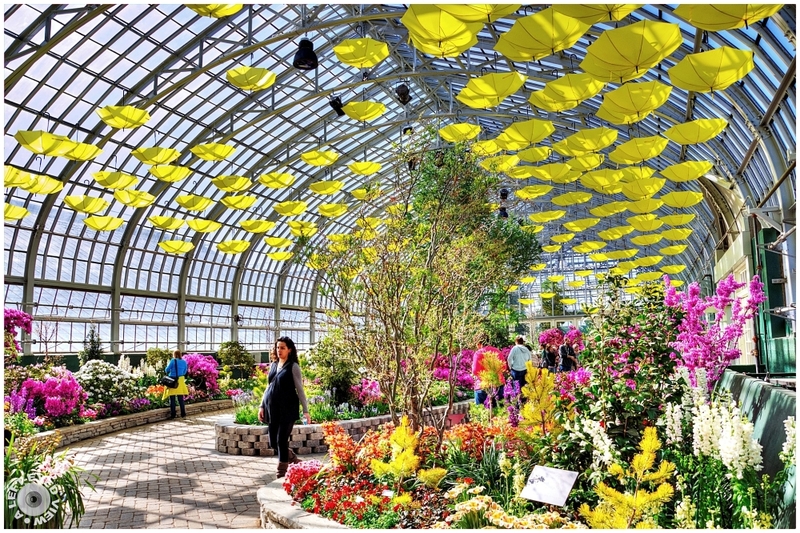 The yellow umbrellas add a extra jolt of spring color to this fine greenhouse scene. Gorgeous colours, right perspective! Nice. A fine picture of this wonderful place! Excellent! A marvelous image with beautiful colors and light ! Great shot and beautiful light. I like the sensational explosion of colour! Beautiful & colorful scene! A pleasant place to be. A beautiful place with wonderful colors and light ... Splendid image !!! This photo could not get more 'spring' in contents. Love the sheer vibrancy of this image.